Academies are publicly-funded independent schools. Independent schools, as defined by the Education Act 1996, are neither ‘a school maintained by a local education authority’ nor ‘a special school not so maintained.’ As of 2014, there were about 4,000 academies in England. "WHAT ARE THE RIGHTS OF PARENTS AND PUPILS AT ACADEMIES?" The Secretary of State and the proprietor of an academy must sign a contract called a funding agreement that specifies how the academy is to be run. This differs from independent schools, where each parent must sign a separate contract with the school. The most important point to realize about these funding agreements is that they vary from one school to the next. Therefore, it is important for parents to understand the funding agreement of their specific school to understand their rights and the rights of the child. Because each academy has its own funding agreement, special educational needs regulations may vary. However, the SEN Code of Practice 2015 applies to all academies. This means that academies have the same duties as maintained schools to safeguard the education of children and young people with SEN. 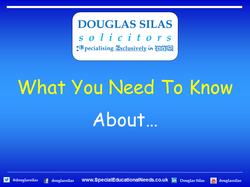 The Academies Act 2010 introduced new rules about the process of becoming an academy. If a maintained school wishes to become an academy, which is the most common way an academy is formed, the Secretary of State consults with the governor of a school to determine whether or not to convert the maintained school to an academy. If it is decided to do so, the Secretary of State will issue an academy order that will enable the conversion. An academy not created from a conversion but rather newly formed is most commonly called a free school. A study must first be completed to determine the school’s potential impact on the existing schools in the area. In the past, SEN academies received a separate payment for specialist support services regarding special educational needs. However, as of 2014, the Department of Education will allocate funds to local authorities on the basis of equivalence. This means that academies will receive the equivalent amount of per-pupil funding as maintained schools from the LAs. Academy funding comes mostly from the General Annual Grant which is paid for by the Education Funding Agency.